We are currently working on setting up a sponsor program. If you, or someone you know, would like to become a sponsor please see the contact page to get more information. More information will be posted here soon. InfraGard is a partnership between the FBI and the private sector, dedicated to sharing information and intelligence to prevent hostile acts against the United States. Members receive access to information not published on the Internet. Your organization can learn the benefits associated with becoming an Infragard Sponsor! 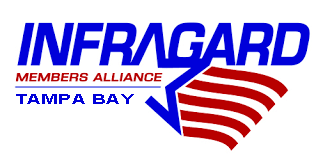 Welcome to the Tampa Bay Chapter of InfraGard! Welcome and thank you for taking the first step to building a safer and more secure country by joining a tremendous organization! As Americans, our lifestyle, economy, and national security are supported by a complex framework of businesses and services. The central role of these critical infrastructures and key resources (CIKR), however, makes them especially vulnerable as targets for both physical and cyber attacks. With the majority of infrastructure in the U.S. owned and operated by the public-private sector, cultivating information sharing partnerships that incorporate key industry stakeholders alongside law enforcement and government entities is crucial to protecting our most important public assets. The FBI’s InfraGard program provides a vehicle for seamless public-private coordination with government that expedites the timely exchange of information and promotes mutual learning opportunities relevant to CIKR defense. InfraGard is a partnership between the FBI and the private sector. It is an association of persons who represent businesses, academic institutions, state and local law enforcement agencies, and other participants dedicated to sharing information and intelligence to prevent hostile acts against the U.S. There are over 84 InfraGard Members Alliances, representing all 16 sectors of our nation’s critical infrastructures. The mission of the InfraGard Program is to foster collaboration and information sharing that enhances our collective ability to address threats to the United States’ critical infrastructure through a robust private-sector/government partnership.